What helps this process along? Where does solar distillation come into all this? How do you use a homemade solar water distiller? What can you use the water for? Do you want to learn more about solar water distillation? Are you wondering about how solar still installations can help you make clean water on demand? Are you looking for easy, quick tutorials that will help you create your very own solar still? If you are wondering about the answers to any of these questions and more, you are definitely in the right place! This is the biggest part of the solar still system. This is where the water you’re going to distill is poured. Look for material that absorbs heat, meaning it stays hot and doesn’t conduct heat very well. You can use a leather sheet, silicon, a mild steel plate, reinforced plastic or galvanized iron. This is what gives the solar still structure. The material you use should also be able to resist heat transfer to the surrounding area of the still. Essentially, the more heat trapped, the more efficient your solar water distillation system is. More heat equals more solar still goodness! Aside from that, your solar still side walls should be able to support the cover and resist the water from spilling. You can use wood, concrete, or reinforced plastic. You can combine materials, with one side wood and the other side plastic for optimum heat resistance. Consider something at least 15mm thick for your solar still walls and you should be good to go. ***Solar power can do much more than distill your water. This DIY guide has everything you need to know about heating your water with nothing but the power of the sun. This is the surface that’s supposed to collect the condensed vapour from the distillation process and the only way for heat to get into the solar still. Your solar still cover should be transparent, resistant to water absorption and can be easily cleaned and very smooth. Typical materials for this part are glass or polythene that’s 3mm thick. It has to be slightly longer than your solar still basin since you’re going to install it an angle so the distillate drips into a receptacle. This is where the distilled water is collected into a trough or passage which then trickles out onto a channel. Typically, it’s a small inlet or tube that lets the water drip into a pail, mug or pitcher. You can use PVC or plastic for this part of your solar still. You can also put a support system for your top cover (as glass can be quite heavy) and additional duct tape to seal all the corners and sides of the still, to make the solar water distillation system more efficient. 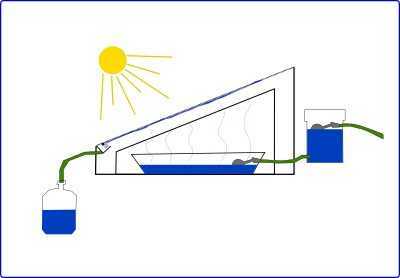 The diagram above shows a very simple solar still. Other variations of the system use multiple trays of water under one large cover to maximize the efficiency of the solar still. Instead of making one large surface for your solar still, separating the water into smaller trays helps the liquid evaporate faster. A larger body of water would need a higher temperature to vapourize. Here’s a setup for a more solar water distiller plans, if you’re willing to create a larger solar still system (especially if you want to have more than a few litres of distilled water in a day. The instructions above are specifically for a single-effect solar still. ***Free yourself from the grid with new DIY technology that can provide power for all of your needs and more. Learn more about why the power companies don't want you to find out about this device. You’ve probably heard and seen distillation in action. It’s basically altering water’s temperature to purify it of contaminants. You rely on the different boiling points of water and other compounds in the liquid to help separate the former from the other substances that are mixed in. Distillation actually mimics the water cycle that you supposedly learned in middle school. Water basically goes through various stages of evaporation and condensation, changing its physical form to be either liquid (found in bodies of water and the liquid we drink), solid (as ice, in certain parts of the world and in a hail storm or as snow and ice crystals) and gas (vapor in the air that we usually feel as humidity). Take a look here for a more comprehensive take on the water cycle, in case you’re into the specific science (or you would like to reminisce about the day you learned this in middle school). Heat from the sun, specifically, and how much the water is exposed to the sun’s rays. Most people are skeptical about the power of the sun to treat water, especially in locations and seasons where you see less solar energy. Experiments and studies have been done, however, that show you can get a fair amount of water during winter season. And besides, you won’t ever know until you try, right? The experiment mentioned above that you can get enough water to drink for one person from distilling for a whole day in winter. Ever heard of a solar still? Essentially, solar distillation uses heat to remove impurities in water to make it relatively safe enough to drink. Instead of generating heat and pressure through machines and fire, you use sunlight and a simple solar still to retain enough heat to create clean water vapour in the still. The solar still then collects the water vapour and condenses it back to liquid form. What you’re left with at the bottom of the solar still is brine and the impurities you were trying to take out of the water in the first place. Sounds pretty simple, right? You’ll be surprised at how simple it is to make your very own solar still. Of course if you're not the DIY-type, feel free to check out our curated list of some of the best water distiller products online. Otherwise, keep reading to learn more about making your own DIY solar still! So you’ve set up your solar still system in a good part of your property and you’re ready to purify some water! Prepare the solar still for use early in the morning, preferably before dawn or the night before. Make sure you put your solar still in an area of your yard or property that gets the most heat throughout the whole day. It should also be a place where you can easily collect the water. Putting the system on the roof is only applicable if you have easy access and can transport water to and from the system easily. Remove the cover of your DIY water distiller and pour a thin sheet of soft or salt water into the system. Make sure the water covers the bottom of the system but does not get into the trough or collection receptacle for the condensed water. Replace the lid and make sure the solar water distiller for home use is sealed. Return to the solar still from time to time to see if there is no more water left. Collect the rest of the condensed liquid on the top cover then clean out your solar still. Wipe your solar still down and add more water to distill again. Depending on how wide your surface is and how hot it gets in your area, the optimum amount of water you can put in varies. It’s best to start with a thin surface and try to add more to see how efficient your system is. If you want to use more scientific methods, refer to this design. Essentially, though, a still that has 10 square feet of condensation surface can produce around 2 litres of water. So you’ve collected your water from your DIY solar water distiller. What can you use this for? As long as you used softened or salt water, the liquid is safe to drink. Black or brackish water may need to be treated first before being put in the solar still or treated twice in the system. In areas where clean water is hard to come by, being able to produce distilled water can improve the health of the community greatly. Washing with clean water prevents microbes and undesirable substances from clinging to eating utensils and clothes. For sick people, bathing in distilled water may be their only option for protecting their skin and preventing further infection. Using clean water improves the taste of food and makes the food free of contaminants. During water shortages and natural disasters where tap water is unavailable, being able to use a solar still in an emergency cans save lives. Solar stills have so many uses, but making the most of them isn’t that easy. As you may have noticed, this system is not that efficient if you have to provide drinking water beyond yourself. And even at 2 litres of water collected per solar still per day, it still doesn’t meet people’s usual water requirement, especially if you live in a tropical country. Expanding your solar still can yield more water—but of course, would need more work. Since you use the gentlest of methods to heat your water, you have to help the process along. Black, brackish water may need to be distilled twice. Using softened water or at the very least salt water can lighten the burden on the system. Leaving your solar still alone can also mean that the water in your receptacle or trough can evaporate again. While this isn’t a bad thing, you’re essentially wasting energy. Part of the success of the system is knowing how much water is best for the temperatures in your area and when you have to collect and replace the water. Depending on how good your system is at resisting and trapping heat, you can use the solar still again (without cleaning) in the evening and collect water in the morning. So now you know that distilling water without fancy machines or high-cost materials is possible. Could there be any downsides to this method? Why isn’t everyone with a large yard and tap water doing this? ***If you want to learn about heating your water with the power of the sun, then be sure to give this DIY guide a moment of your time. It claims to be able to provide your home and family with stable hot water, without the worries of a water heating bill. The water you use for the system can be taken from the tap, the ocean, or even a nearby body of fresh water. Since there are no moving parts, you can be sure that your materials don’t experience wear and tear. Cleaning the solar still is easy especially if you used materials that really don’t absorb liquid that much. In extreme emergency situations, people lost at sea may be able to construct solar stills to increase their survivability. You literally leave it out in the sun. You don’t have to use fuel or even mechanical energy (your arm or leg power) to generate heat. Unless you want to pay yourself for fetching water from the lake, river, stream, your tap or your rainwater collection system, you don’t have to pay for transporting water at all. Commercially-bought stills are more reliable than solar systems. If you’re planning on providing drinking water to more than yourself, commercial systems have more output. One full day usually yields 2 litres of water. That’s not enough for a healthy adult as we usually need 8 glasses of water a day. The cost of the basin and glass cover alone makes it a very unattractive option for poor households to use. Unless materials can be found that work as well as glass, leather or high-quality plastic, third world countries may find it hard to rely on this system. It’s up to you if you want to risk the dangers and high cost of setting up a solar still to add a green water source for you and your family. No matter the cost, though, the fact that operating solar water distillers for home requires no additional costs beyond materials and construction makes it a good system. You eventually recoup your losses from the materials since you don’t spend anything beyond that. So if you’re planning to try this system out, make sure that you’ve scouted your local hardware store for all the materials first and have worked out the best spot on your property to use the system. Don’t forget to monitor the solar still to see the best amount of water you can purify in a day and clean out your troughs and basins regularly to decrease buildup of brine. Once you’ve got your system up and running, why not drop us a comment and tell us about your experience?